Aaron got me a popover pan awhile ago, but I haven't used it yet. 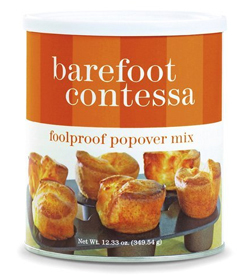 I was thinking about getting the Barefoot Contessa Foolproof Popover Mix, but when I looked at a recipe for popovers and saw how simple the ingredients were I thought it would be ridiculous to not make them myself. Hmmfff. My popovers were more like popunders. Very disappointing. I made another batch and they started to pop a little but still not enough. I think it's all in the technique, so I will keep trying. oops, should be dripping OR oil! I think popovers = Yorkshire pudding. You might have done this, but you need to put the pan (with a little dripping oil in each cup) in a 450 oven to get smoking hot before you pour the batter in. I have never had Yorkshires turn out better than with this recipe. I have made it in muffin tins and in one pan. It is truly glorious and billowing golden when done in a pan though. Yorkshire Pudding: The oven should be heated to 450° F. Mix the milk, eggs and salt and add pepper, beating all well together. Let these ingredients stand for 15 minutes and then whisk in the flour. Meanwhile, add the dripping to the pan and put it in the oven to heat for about 10 minutes. Into this intensely hot pan, you should put the batter and cook for 20 minutes or until well puffed and golden. I've learned, to my sorrow, that the fewer the ingredients the more difficult the dish. The other posters are right though - the smokin' hot pan is the main secret to success here. 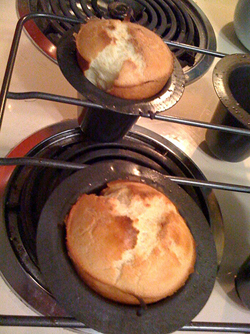 Jenny the Wegmans recipe for popovers turns out great!